Here are some photos for Spiderwick many I haven't posted yet! This is Taylor! 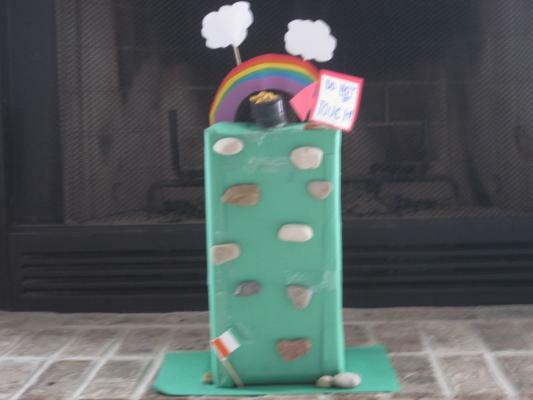 Here is my leprechaun trap I made for St. Patrick's Day. Leprechauns are attracted to signs that tell them not to do something by doing it anyway. They would climb the rocks glued to the box I covered then they would find the "gold" and they would trip in the hole I made in the top. There's a leprechaun trap for you! Cover the box in stuff that makes it feel at home. I noticed when that night the fools gold kept coming off the top. Maybe I can't out smart a leprechaun after all! dude i don't think thats gonna work. Anyway I'm making a new one, this time it's going to be better. Anyway who are you??? oh my names Dre. i live in Australia but i use to live in Detroit in Aamerica (if ya know where that is). my friends got a site too and i just saw a link on a comment page to your site so i went to visit it. Okay and yes I know where Detroit is. I'm guessing you saw it on Amy's website. I'm Tay1023. yeah i know. and i'm guessing your real name's taylor. i'll just call you that. Oh, I'm on school summer break! I start back school in a few days. So I won't be on that much any longer but I have a half day of school every Wednesday started the second week I go back. Since we live on the other side of the Earth, almost everything is different, our seasons, the way we write the date, says things differently, and I guess school. Because I heard that we say aluminum differently. Okay I hope we can do it. And I also think it's a good idea to have Jack writing because you can get it done faster! Oh yeh that was me. Sorry I forgot to add that => -Amy 5:11PM 7/08/10, Saturday.